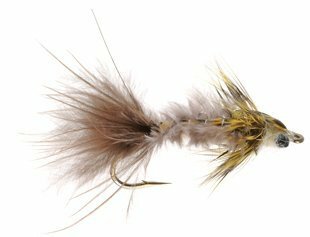 Carp flies are a relatively new category to our Fly Recipe Library but rightfully so. The carp revolution has begun and fly anglers all over the Country are enjoying this freshwater beast. Native to Asia, carp were introduced to the US in the early 1800’s from Germany. They thrive in muddy bottom, heavily vegetated waters and will seek out their preferred temperature range of from 60-70 degrees for feeding. Weighted flies work well, especially where you can bounce the fly on the soft bottom creating a puff of mud. Many trout nymph patterns are very effective for carp as are some earth tone bonefish flies. Crayfish patterns along with hexagenia, damsel and dragonfly nymphs are the most properly used trout patterns. Pictured here is a good example of a trout fly turned carp killer; Bear's Hex created by Jeff "Bear" Andrews. Carp specific patterns are now being created by some prominent tiers with many of the recipes including some sort of weighting. Hook sizes run at a range from 2 to 10 with size 6 being the most popular size. Movement is a big issue with carp patterns which is why you will find a good deal of rubber legs, marabou and rabbit fur in many recipes. As for colors tan, brown, olive and rust are the most often used colors with some patterns using three of the four in one fly design.